The sacrament of the Eucharist is a celebration of Thanksgiving that joins individuals in a special way to Christ and the Church. The Eucharist completes Christian initiation, honors Christ’s death and resurrection, and bestows the faithful with the food for eternal life. 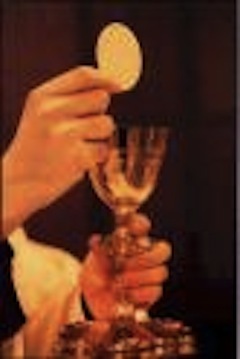 The living bread and the cup of salvation are “the source and summit of the Christian life.” By sharing in the sacrament of the Eucharist, communicants become united in Jesus’ great sacrifice for man.